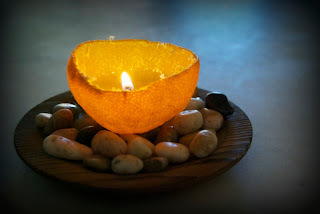 Why burn toxic synthetic materials, or exorbitantly priced soy and bees wax, when the perfect citrus mood-lighting is sitting in your compost? Indie Lee, founder of the all-natural skincare line, Indie Lee & Co, shares one of her at-home secrets for an all-natural clementine candle - no wax necessary! 1. Cut clementine in half. 2. Carefully peel skin off as a whole. 3. Twist the inside into a wick. 4. Fill with a bit of olive oil.